Aging is the prime risk factor for the broad-based development of diseases. Frailty is a phenotypical hallmark of aging and is often used to assess whether the predicted benefits of a therapy outweigh the risks for older patients. Senescent cells form as a consequence of unresolved molecular damage and persistently secrete molecules that can impair tissue function. Recent evidence shows senescent cells can chronically interfere with stem cell function and drive aging of the musculoskeletal system. 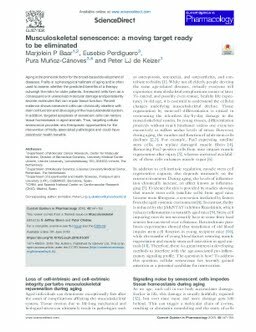 In addition, targeted apoptosis of senescent cells can restore tissue homeostasis in aged animals. Thus, targeting cellular senescence provides new therapeutic opportunities for the intervention of frailty-associated pathologies and could have pleiotropic health benefits.